Several years have passed since Sarkhan Vol saved Ugin from death at the hands of Nicol Bolas. More than a thousand years before Sarkhan's home era, Ugin lives, asleep in his hedron cocoon. Sarkhan Vol disappeared into the time streams, swept away to an uncertain fate. For Sarkhan, for Ugin, and perhaps for the Multiverse as a whole, this is welcome news. 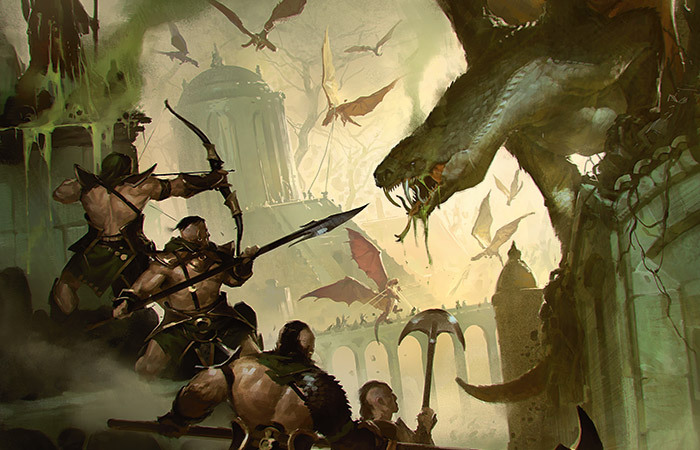 But for the clans of Tarkir, Sarkhan's actions have brought tremendous hardship. The dragon tempests have intensified, and the clans are being overrun. Daghatar, khan of the Abzan, recently abdicated in favor of the dragon Dromoka in a desperate bid to save his people. High in the mountains of the Jeskai, the khan Shu Yun has convened an unprecedented summit, a meeting of minds that must do the impossible—or the khans themselves will vanish into history. "Although they seem at odds, the clans live in subtle harmony," said Shu Yun. He paced as he dictated. The only sounds in the high tower room were his own quiet footfalls and the soft whisper of an inked brush on paper. 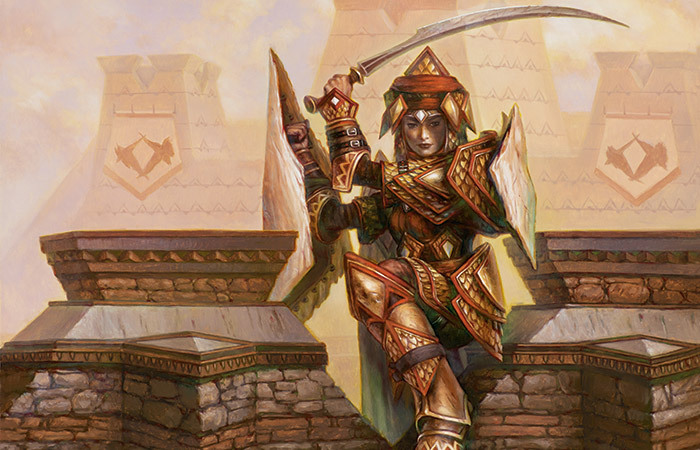 "The Abzan promote stability and trade, patrolling the roadways. The Mardu range far and wide, killing dragons that might otherwise grow to menace the other clans. 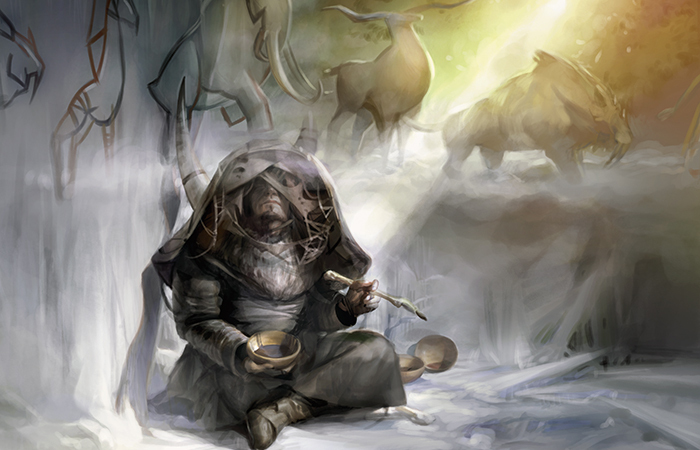 The Temur are hardy folk with deep spiritual roots, and their shamans warn the other clans of dangers lurking unseen. 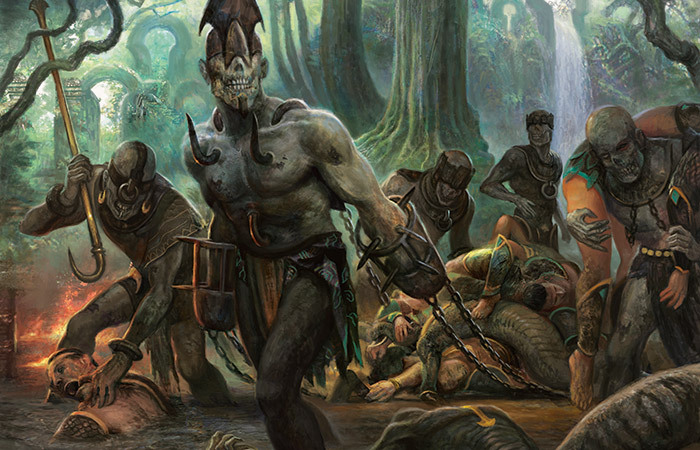 Even the Sultai, untrustworthy although they may be, keep the pests and horrors of the swamplands under control. 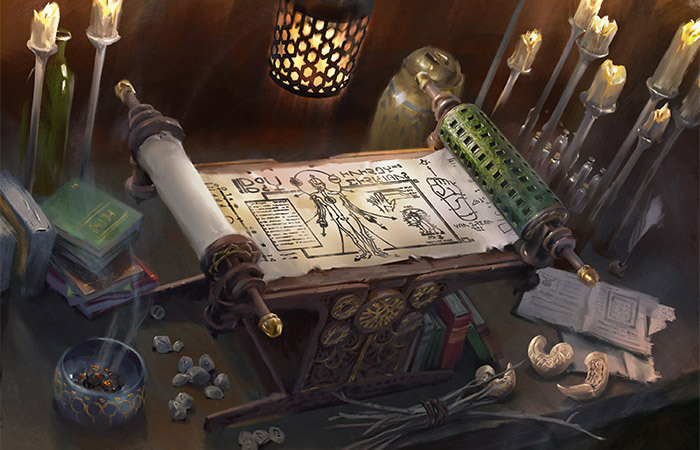 And the Jeskai, above the rest in their mountain monasteries, serve as Tarkir's memory, keeping records of the tales, secrets, and truths that might otherwise pass into the tumult of history." As he spoke, a shaven-headed initiate entered and knelt patiently. Shu Yun knew she would wait for hours if he made her, but it would take something extraordinary to justify that. This was just his pet project, a history of Tarkir, although admittedly it had grown more urgent of late. "Master," said the initiate, rising and bowing. "The final delegates have arrived." "Thank you," he said. "Show them to their quarters, and see that they're comfortable. They will complain about the cold. Rest assured that this does not reflect poorly on our hospitality, only our geography." "Ask all of them to meet me here in one hour," said Shu Yun, "under minimal guard." He would learn a great deal from who arrived first, and what sort of guard each of the khans considered minimal. "And remember to call them khan," he said, smiling. "It is their way." The initiate hurried out, and Shu Yun turned to his most trusted scribe, Quan. When Shu Yun had set out for this summit, he brought Quan with him. There was no scribe more reliable, and Quan could write for many hours without stopping. "That's enough dictation for today," said Shu Yun. "But there will be more for the Annals before the day is done. How's your hand?" "As ever, Master," said Quan. "Ready." "Good," said Shu Yun. "This meeting may be tense, even violent. Whatever happens, write it down. Our descendants will thank you." If we have any descendants. It had been years since the dragon tempests had intensified. 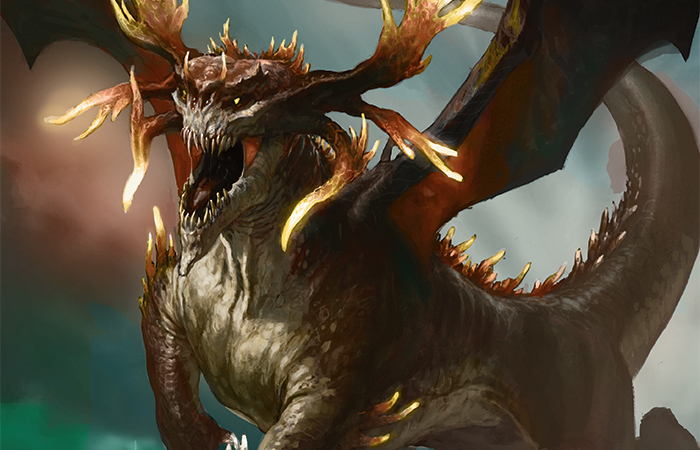 All across Tarkir, seemingly in an instant, they went from maintaining the dragons' numbers to swelling them immensely, great thunderclouds of wings and fangs tumbling out of a boiling sky. No one knew why, but it no longer mattered. This meeting, this council of khans, was Shu Yun's desperate effort to improve the odds of survival. He walked to the window. The air was cold on his bare shoulder, but he noticed it only distantly, as one might notice clouds on the horizon. That shoulder had been bare for many decades, ever since he had slain his first dragon and been marked with the winding dragon tattoo of a ghostfire warrior. Below him stretched the great lake that surrounded Dirgur Stronghold and the island on which it sat. Small boats plied the waters, ready to scatter if sentries sounded the bells that signaled the approach of dragons. In the courtyard below the tower, a small contingent of Abzan soldiers was filing out of their war barge. 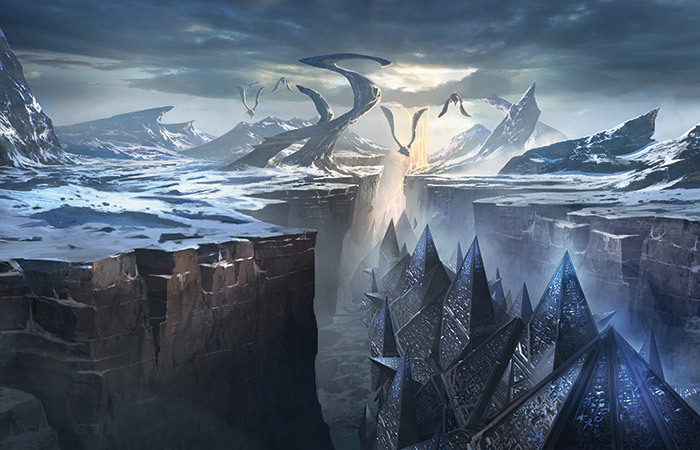 Dirgur was neither the most amenable nor the most secure of the four great Jeskai strongholds, but it was the closest to the Salt Road and the other clans' territories. Shu Yun stared out the window in standing meditation, losing himself in the whistle of the wind and the white-capped dance of the distant waves, waiting for the other khans to break his reverie. Quan, ever vigilant, sat silently behind him, ready in case this meditative state yielded some sudden addition to the Annals. 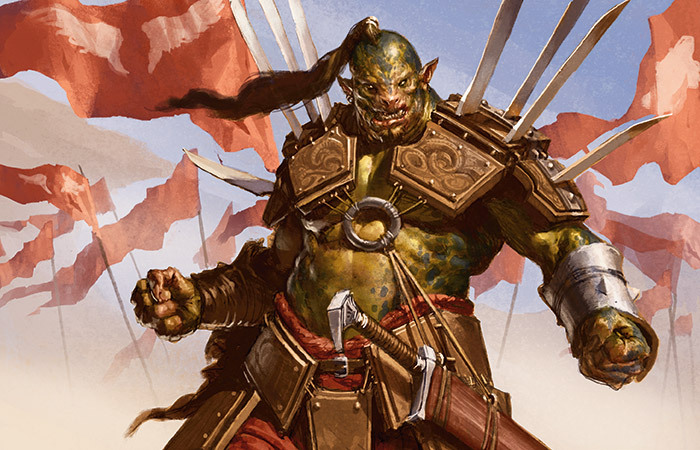 The first arrival was the Mardu khan Alesha, who swept in with only two guards in tow—a towering male orc and a lean, sharp-eyed human woman. Alesha's head was bare, her long hair flowing loose. She was young, and proud, and Shu Yun wondered whether she would understand his perspective. She flashed him a predatory grin. 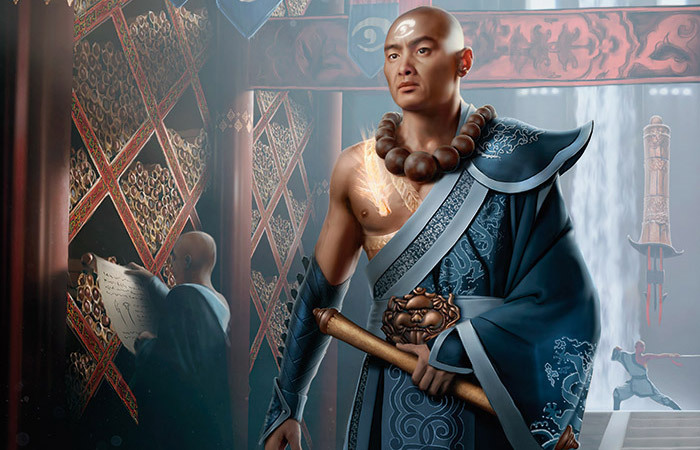 "The Jeskai welcome you," said Shu Yun, bowing. "And the Mardu rank and file told me you could stick it in your ear," said Alesha cheerfully. "But I'm here. If you're willing to talk, I'm willing to listen. Hopefully they haven't chosen a new khan yet." Her orc bodyguard frowned and said, "They follow only you, my khan." Alesha looked back at him, her smile fading. "And that will be true," she said, "until I lead where they won't follow. This might be it." "Then I welcome you all the more," said Shu Yun. After that came Reyhan, a stout woman, armed and armored, who styled herself khan of the Abzan. 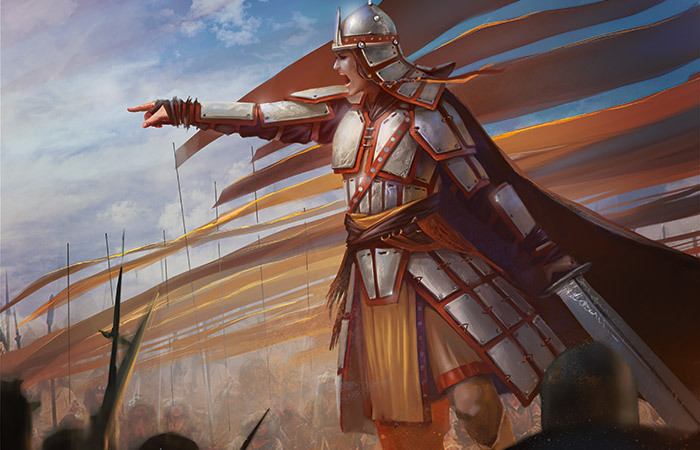 Daghatar, longtime khan of the Abzan and a formidable leader, had been bent to a dragon's service, and had taken most of his clan with him—a shocking turn that had led Shu Yun to propose this unprecedented meeting. Reyhan was half a khan with a tenth of a clan, and Shu Yun knew the others would not take her seriously. Reyhan bowed to Shu Yun and Alesha, exactly proper. Her honor guard of four Abzan soldiers took up positions along the wall. "Welcome," said Shu Yun. "I commend you for coming. You have the least to spare of any of us." "Perhaps," said Reyhan. "But we also have the most to lose if this effort fails." Next to arrive was Yasova, khan of the Temur. Shu Yun had met her once, years before, before she was khan. Now she looked weary beyond her years, leaning on her long, claw-tipped staff. She came alone. Shu Yun bowed in greeting, and Yasova bowed back. "It's good to see you again, Dragonclaw," said Shu Yun. "I can't say the same," said Yasova. "No offense, but I'd rather none of us were here." "None taken," said Shu Yun. "I think all of us would prefer it that way. But this is bigger than any of us." Last to arrive, wheezing from the climb and bundled comically under two people's worth of furs, was Tasigur, the arrogant, treacherous khan of the arrogant, treacherous Sultai. 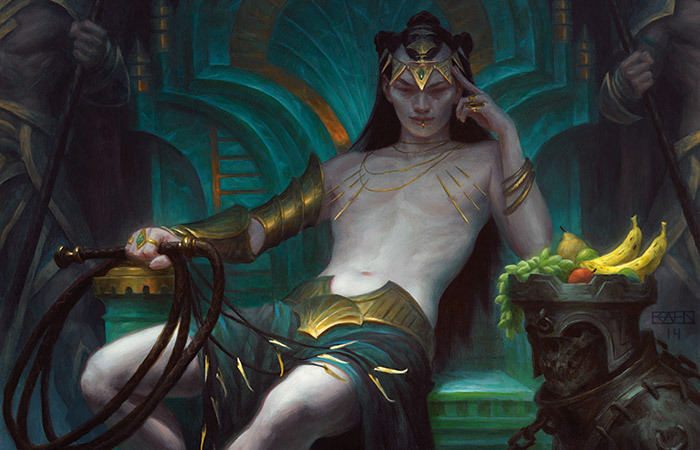 Behind him came a full dozen Sultai troops—all human, noted Shu Yun, and all living—none of the foul sibsig zombies among them. Tasigur was the youngest and the proudest of all of the khans, but the last few years had not been kind to him. Worry creased his brow, and he looked even more wan than usual. He looked around the room with beady eyes. "I'll be damned," he said quietly. "We're really all here." His eyes fell on Reyhan. "Well, almost all of us. No offense, of course." "Welcome, all of you," said Shu Yun. In the corner, Quan brushed quiet calligraphy on a fresh scroll. "This meeting is unprecedented, and I'm afraid the protocol is rather vague. But I expect all of us to treat one another with the deference due our station." "Of course," said Tasigur, bowing. "Forgive my rudeness, ahhh…"
"Reyhan," said the Abzan, through gritted teeth. "…Reyhan Khan. As I said, I meant no offense, but only to acknowledge the dire circumstances in which we all find ourselves." "Dire circumstances," snorted Alesha. "And if your own circumstances were better, no doubt you wouldn't be here at all. The way I hear it, these days you're lord of nothing but scrawny servants and thirsty bloodflies. Or have the naga finally returned to hold your hand?" "Such bravado!" said Tasigur. He rounded on the Mardu khan, although he had to look up several inches to look her in the eye. "You'd think it came from something more than a glorified bandit covered in dust and horsesh—"
Alesha's orc bodyguard rested his hand on the haft of his axe. "That's enough," said Shu Yun. "We are here because all of us, and our clans, are in existential danger. We can no longer afford to fight each other. We can no longer afford even to fight the dragons separately. We must stand together, or our ways of life will vanish from the world." Alesha held Tasigur's gaze for a moment longer, then shrugged. She gestured, and her bodyguard relaxed. "Shu Yun is right," she said. "If our circumstances were better, none of us would be here." "No," said Tasigur, hard-eyed. "We wouldn't." "Everywhere," said Shu Yun, "dragons are overrunning our homes. No one can deny that the storms strike more often now, and more intensely. There are simply too many dragons. No one seems to know the reason for it, what changed. But everyone knows it is true." "I know the reason," said Yasova quietly. The other khans turned to her. Shu Yun glanced sharply at Quan, who was too busy writing even to notice his khan's eyes on him. Good. Yasova slumped. She looked tired. Defeated. Shu Yun found that far more dispiriting than the squabbling of the younger, prouder khans. "It was years ago," said Yasova. "I was on…a vision quest, of sorts. I had foreseen that the dragon storms would cease if I…" She grimaced. "I know how it will sound. 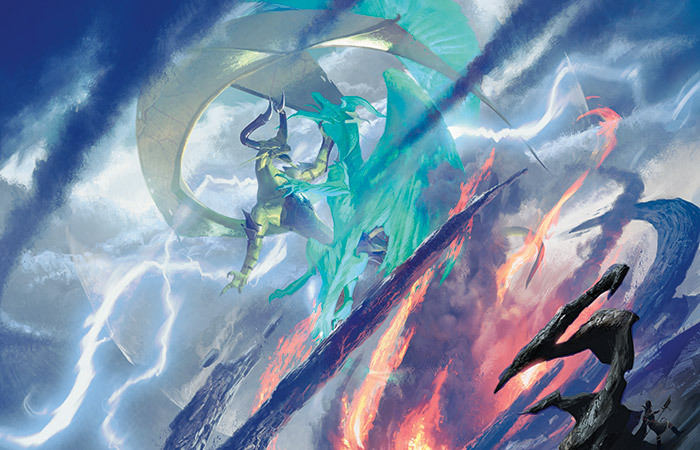 But I saw that the storms would cease if I helped a malevolent dragon spirit kill the great Ugin." There was murmuring. Everyone knew the name Ugin, even if no one understood exactly what he was. The Jeskai knew him as a font of wisdom, the source of the magic that concealed them against the predations of dragons. "You sought…to kill the Spirit Dragon?" said Shu Yun. "I had to!" said Yasova. "Your people die to the dragons, just as much as mine. If you thought you had the slightest chance to end the tempests, to bring the dragons under control, wouldn't you take it?" "Ending the storms would do more than bring the dragons under control," said Alesha. "It would eradicate them." "Killing Ugin would stop the tempests?" said Tasigur. His eyes were greedy. "We could end the dragons once and for all?" "I was a fool," she said. 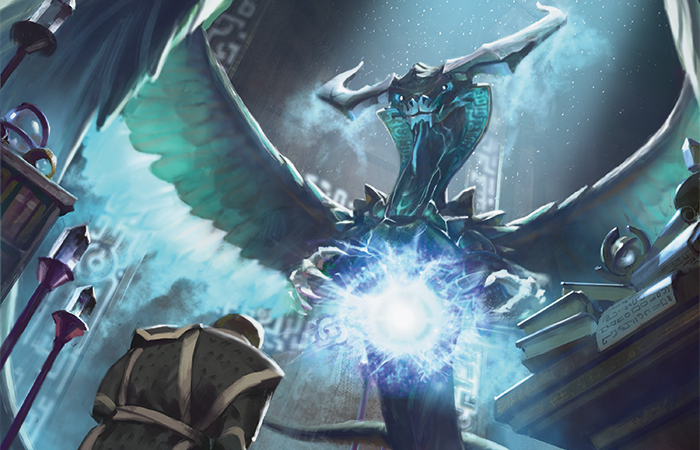 "Ugin is power. He is a force of nature. Even with the help of a spirit, how could I have thought it possible to destroy him? How could I have thought it wise?" "I led the spirit to him," she said. "I showed it the way. In the skies above the tundra, the two dragon spirits fought. The world shook." "I remember tremors," said Shu Yun, "just before the storms intensified." "Everything was coming true. The other spirit cast Ugin down and vanished. Then…then he came. Another spirit. He appeared to me first as a vagrant, then as a great dragon of no breed I have ever seen. He called himself sar-khan, great khan. He told me of a future with no dragons in it, but not the prosperous future I had seen. A future where the khans fell to infighting and Tarkir was a place of ruin and war. "Ugin's body struck the earth, and in that moment I knew that the sar-khan was right. 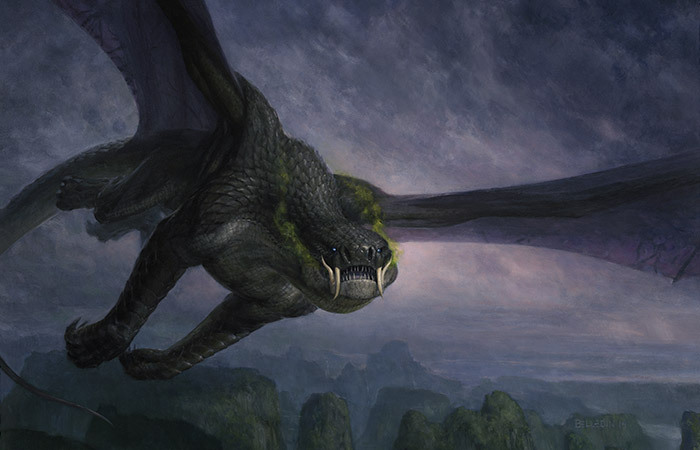 Ugin was dying, and a vital force in the world was dying with him. The storms were dying with him. For a moment, everything was still. The sar-khan was wounded. I healed him, thinking to interrogate him, certain I had won, no longer certain I was right to. But he…he used some kind of magic I've never seen before. He encased Ugin in a great stone cocoon inscribed with draconic runes. The stillness ended. The tempests returned fourfold, the sky howling with fury at my presumption. And the sar-khan was gone, vanished back into whatever spirit world he came from. "I didn't know what to do. Everything was worse than when I started. I tried to contact the other dragon spirit, to tell him that Ugin yet lived, to implore him to finish the job. I tried to breach the stone myself, with every force at my disposal. I even tried to heal Ugin through the stone, to beg him to calm the tempests and at least return things to the way they were. Not a hint. Not a scratch. Not a breath. The cocoon yet stands, and Ugin lies within it. The storms have raged ever since." For a moment, no one said anything. "You," said Reyhan. "You let this happen. You made it happen. You've killed thousands of my kinsmen, forced thousands more to bend the knee to a dragon! Do you have any idea what you've caused?" Yasova took a deep breath, but said nothing. "Do you have anything to say in your defense?" said Reyhan. "Any reason at all I shouldn't drag you back to the only free Abzan fortress left and hang you from the walls for everyone to see?" Shu Yun interposed himself between Reyhan and Yasova. The summit was his idea, under his truce, and he wouldn't see it end in violence. "No," said Yasova. "None. I came here alone. I left my clan behind. If you want to kill me for what I've done, kill me. I just wanted to make sure that someone knew the truth." A brush moved across paper. "You did what you thought was right," said Alesha. "No one can fault you for that." "I have no interest in placing blame," said Shu Yun, "or absolving it. The important thing is that we know more than we did. Perhaps that knowledge will save us." "Our course is clear," said Reyhan. "We must pool our efforts and open that cocoon." "Strike down Ugin," said Tasigur. "End the storms." 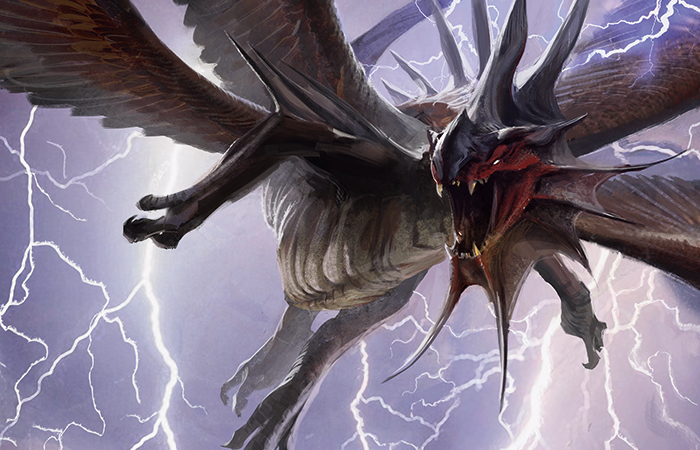 "The Jeskai will not aid any effort to kill the Spirit Dragon," said Shu Yun. 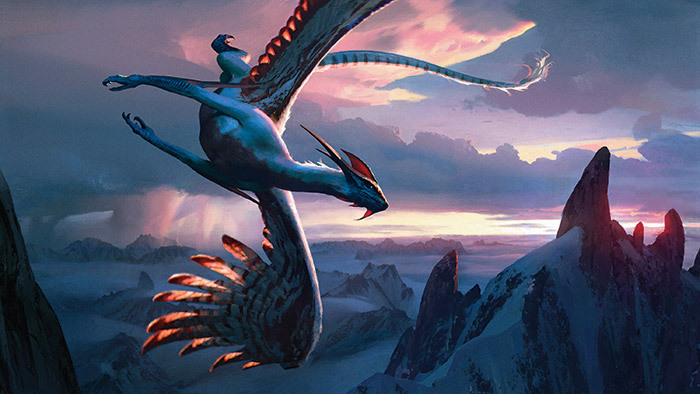 "Ugin has always sought balance. Are your memories so short? He gave us concealment magic, the last time the dragons seemed to be gaining the upper hand. He values the dragons and the clans alike. If he were well, this would not be happening." "Then we open the cocoon and heal him," said Reyhan. "If he truly values balance, he'll intervene. And if he doesn't, there's always Tasigur's plan." "He's as likely to punish us as help us," said Alesha. "It's the great dragons we should be worrying about—they're flourishing in his absence. Forget Ugin. We should focus all our efforts on killing the brood-lords." "There's no need for that," said Shu Yun. "The destruction of the dragons is no better than the destruction of the clans. We must seek balance. We must seek Ugin." "The time for balance is past," said Tasigur. "We—"
"Wait," said Alesha. "Do you hear that?" The voices of the khans fell silent, and everyone could hear what she heard: a low, mournful bell ringing, far to the east. Then another, louder—and another. He moved quickly to a window on the east wall, not quite running. Out above the lake, heavy shapes on short wings slid over the water in a V formation, their shadows rippling beneath them. There were dozens of them. At the head of the formation was the biggest, a malevolent smear of darkness against the sky. "Silumgar," said Shu Yun. The great swamp dragon had never before dared come up into the mountains. Dragons were highly territorial—surely Ojutai and his brood would drive them off. All the khans save Yasova started giving orders, sending word to their troops to be ready for attack. Then came more bells. To the north. Shu Yun crossed to a north-facing window. Ojutai himself skidded along the surface of the lake, ice-flecked waves swirling in his wake. Behind him came at least twenty dragons of his brood, as graceful as Silumgar's were ponderous. Shu Yun had fought Ojutai, once. He'd been lucky to survive, and he didn't relish the thought of facing the great dragon again. "Never thought I'd be so relieved to see a dragon," said Reyhan. "They'll fight the others…. Won't they?" The courtyard below became a scene of chaos as the khans' orders were relayed. The pealing of the bells was ceaseless, seemingly from every direction. Out over the water, the two massive flights of dragons raced toward each other, crashed together…and merged, into a single cloud of soaring death that turned and headed straight for Dirgur Stronghold. "They're coming here," said Shu Yun. "All of them are coming here." "Dragons don't cooperate," said Yasova. "It's never happened." "They might," said Shu Yun, "if they thought they could kill the khans themselves." "They don't take human servants either," said Reyhan. "Times have changed." The evidence, soaring toward them across the lake, was incontrovertible. "How would they know we're here?" asked Alesha. "We flew no banners, any of us. And I doubt they'd cooperate like this just to attack a stronghold." "Someone must have told them about our little summit," said Reyhan. 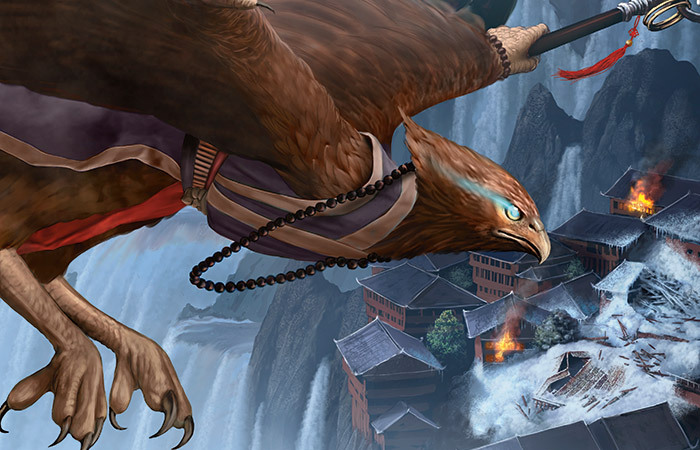 Alesha's hand flew to her weapon, her eyes fixing on Shu Yun like an eagle watching a rabbit. "Someone did." The bells tolled. The dragons drew closer. Quan kept writing. "I did nothing of the sort," said Shu Yun. He ran a hand over his tattoo, which shimmered with magical light. "No dragon will suffer me to live. Why would I ally with them?" "You'd forfeit your own life and all of ours if you thought it would save your clan," said Alesha. Her two bodyguards stood behind her, hands on their weapons. "Yes," he said finally. He shrugged. "Honestly, I don't think it would." All eyes in the room swiveled to Tasigur's guards. Half of them had left as the khans shouted orders, and the Sultai khan was no longer in the room. "I thought you'd never ask," said the head of Tasigur's guard, a scarred man in ornate armor. Alesha and her bodyguards charged, and the room erupted in chaos. Shu Yun slipped off to the side, keeping one eye on the battle. "Quan," he said. "Give me the Annals. They must be preserved. There's a room beneath the stronghold where they'll be safe." "I'll take them there," said Quan. He started packing them up, frowning as he smudged the still-wet ink. "I'll take them faster," said Shu Yun. He glanced meaningfully to the window. Quan's eyes widened. "Master, you cannot," said Quan. "Are you worried for my safety?" asked Shu Yun with a smile. "Or the scrolls?" "The scrolls," said Quan, without hesitation. "No individual is vital to the clan, but knowledge is our lifeblood." "You are a wise man," he said. "Give me the scrolls. That's an order. I will see them preserved, no matter what happens." Quan finished packing the scrolls into their case and handed it to Shu Yun, bowing. They were not the entirety of the private history Shu Yun called the Annals of the Sage Eye, but at least the latest few chapters and the account of that calamitous day would survive, and the rest would be secure at Sage-Eye Stronghold, at least for a time. Shu Yun strapped the scroll case to his belt. Tasigur's guards were dead, along with two of the Abzan, and Alesha was cleaning the scarred man's blood off her blade. Reyhan was nursing a wound to her shoulder, but Yasova's magic was already knitting it together. "Come on," said Alesha. She was smiling again—that unnerving, mirthless smile. "The khans, standing together against the dragons. Not quite what you were hoping for, but it'll have to do." Shu Yun bowed. "I'm afraid I have a different role to play," he said. "Good fortune and good hunting. Do not underestimate Ojutai—he is as cunning as anyone alive. And if you find Tasigur…remind him that he came here under truce." Shu Yun glanced out the window. The skies around the tower were thick with dragons of two different broods, searing cold and corrosive acid blasting out of dragons' mouths. He unfocused his eyes, found his moment, and jumped. Wind rushed past him. Then a surface slammed into his feet—the scaly, slippery hide of one of Silumgar's dragons. He crouched low, unbalanced by the bulky scrolls. It had been much like that, his first kill. No ropes, no assistance, just a foolhardy young man and a very unlucky dragon. His dragon tattoo flashed with magical energy, and he slammed his palm into a very particular spot on the dragon's skull. The dragon shuddered, rolled, and began to fall. A glob of its corrosive spittle hissed against Shu Yun's sleeve. 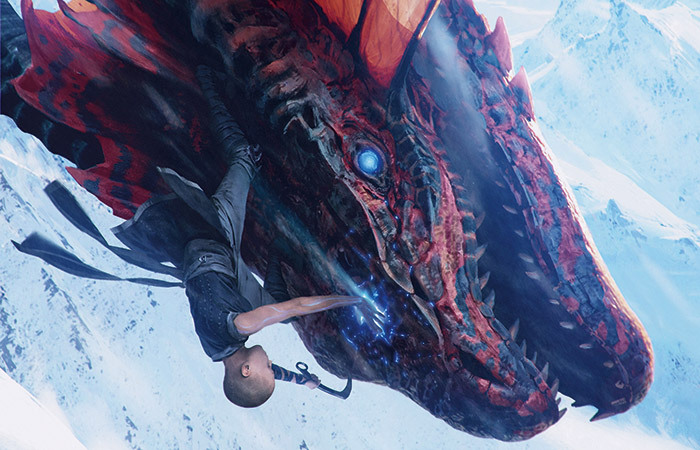 He held on tight as the dragon's half-gliding, unconscious body spiraled toward the ground. At the last moment, Shu Yun sprang off the dragon's back, spun in the air, and landed on his feet in a low crouch. The dragon landed face-first behind him with a wet crunch. The courtyard was a mess of running soldiers, strafing dragons, and a mounting pile of corpses. Shu Yun ran for the gates of the stronghold. Inside, Shu Yun ran past troops rushing the opposite direction. He wove a very particular path, through hallways and down stairwells, to a nondescript room deep beneath the stronghold. He thanked fortune and fate that he'd spent time at Dirgur in his youth and knew its secret places. He pushed open the door. The room was dusty and long unused. He tucked the scroll case into a corner, turned, and left. There was a lock on the door, and a key in the lock. He shut the door, took the key, swallowed it with a shudder, and ran back to the courtyard. He blinked in the sunlight. There were many more humanoid corpses, and only a few of dragons. Globs of smoking black liquid and patches of ice marred the courtyard and the walls of the buildings. A shadow passed over him, and then a massive form settled gracefully to the ground in front of him: Ojutai himself, looming above him, elegant head cocked to one side. "Ojutai," he said. He spread his arms wide, palms out. "You know who I am. You know what I've done. Once I dreamed of facing you again, of testing my skill against yours. But I come to you now with a different purpose." He dropped to his knees, looking up at Ojutai. Past the dragon, in the window of the high tower, Quan looked down. Shu Yun nodded, and Quan bowed his head. "Kill me," he said. "Kill everyone who bears the mark of a dragon slayer, if you must. I offer you my life. But please, I beg you, as one teacher to another…spare my clan." "The dragonlord agrees to your terms." Ojutai's jaws opened, and the cold that poured out of them was the heart of a glacier, the end of the world. The khan of the Jeskai fell. Quan saw his master die, crusted with rime and frozen into a pose of abject supplication. No individual is vital to the clan, he'd said. But Shu Yun was close. Yasova, Alesha, and Reyhan had pooled their efforts. Reyhan stayed behind with her troops, fighting off dragons, until they were overwhelmed. Reyhan was felled by Silumgar himself. Yasova and Alesha boarded a small, swift boat with Alesha's bodyguards. 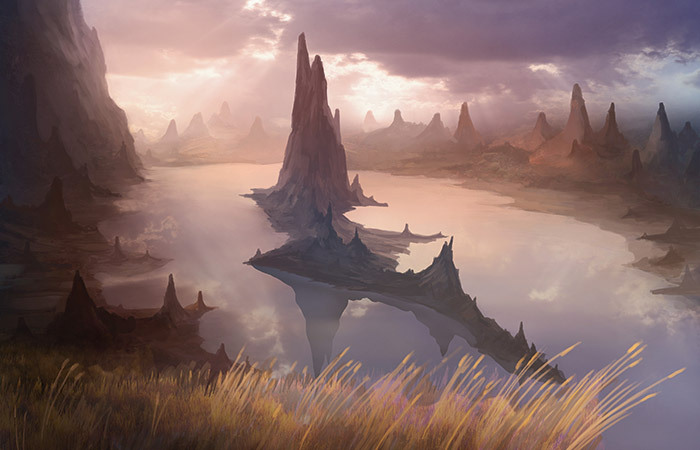 Quan watched them sail away, as Temur magic and Mardu archery sent their dragon pursuers crashing into the lake, until they reached the far shore and whatever safety the Salt Road could offer. By that time the battle was over, and Quan had done nothing. He was an artisan and historian, not a fighter. It was his role to watch. Silumgar and his dragons were gone, too, chased away by Ojutai's brood as soon as the hostilities ended. Quan thought he saw one of them carrying a human. 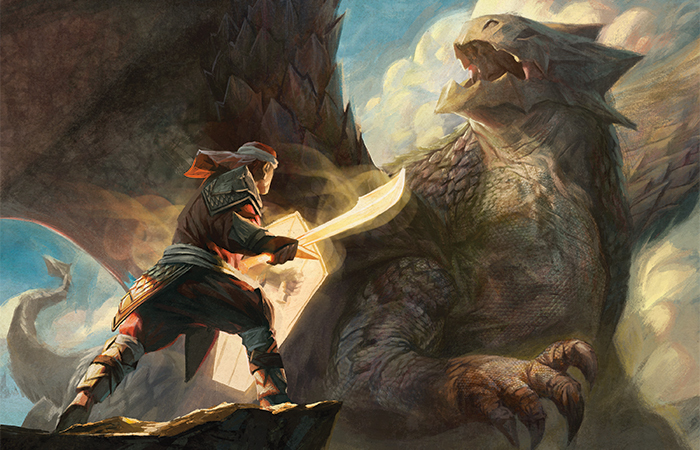 Down in the courtyard, Jeskai monks and soldiers were laying down their weapons and bowing before the great dragon Ojutai. Quan hurried to join them. He dropped to his knees before the dragon, which towered over him. Quan was not like Shu Yun. He had never faced a dragon. He prostrated himself beside his master's frozen body. The dragon barked and hooted. "Great Ojutai announces that the Jeskai are no more," said the aven. "Your khan has fallen, as has one of your strongholds. The others will follow. Great Ojutai commands…"
The aven faltered, just for a moment, then continued. "…that this body and the other fallen be disposed of without ceremony, and that…that every individual who bears the tattoo of a ghostfire warrior be put to the sword." There was angry murmuring, among those assembled, but there were dragons all around them. Ojutai spoke again in Draconic. "You," said the aven, pulling Quan to his feet. "You're a scribe?" Quan nodded, looking down at his ink-stained fingers. "Great Ojutai has a task for you," said the aven. "As of this day, there are no more clans. There are no more khans. Those words will not be spoken. Search within your records, in every archive, and scrub the names of the clans from existence. Your history begins today." Quan looked up into Ojutai's shining eyes. He thought of what he had written today, wherever Shu Yun had hidden it away. He hoped someone found it. He hoped they kept it safe. "It will be done," he said. Silumgar had squeezed his heaving bulk into the palace, smashing down walls where he had to. The dragon had carried the throne—Tasigur's throne!—back to its rightful place in the great hall, then curled around it and fallen asleep. Drool oozed from Silumgar's jaws, dribbling down the throne and eating away at its ornate decorations. Being carried back from Dirgur in one of those great scaled hands had been bad enough. Seeing a dragon ruin his most prized possession, in his own palace, without even bothering to wake up—that was too much. The traitorous naga Shidiqi, who had abandoned Tasigur and sided with Silumgar, waited next to the dragon. Tasigur kept a respectful distance, but his patience was thinning. "Wake him up!" he called. "I have an audience!" "Silence, worm!" said Shidiqi. She was clearly enjoying herself. "The dragonlord sleeps and wakes as he pleases. And he doesn't like to be disturbed." "I said wake him!" screamed Tasigur. "I was promised a place of pride! This…this…this invasion is not what I agreed to!" Silumgar stirred. Shidiqi slithered back, out of range of his claws. The dragon's mood could be foul when he first woke. The dragon opened one eye and rumbled in Draconic. Shidiqi answered back, and Silumgar rumbled more. "The dragonlord apologizes," she said, practically purring. "You were indeed promised a place of pride." This was wrong, Tasigur thought. She was too damned happy about it, whatever it was. He turned, but three zombie servants had surrounded him. Two grabbed his arms, and the other clapped a heavy collar around his neck, inlaid with gold. It was attached to a chain, gold plated, that trailed around, and away…to the other end, which Shidiqi presented to Silumgar. "You can't do this!" yelled Tasigur. "We had an agreement! I am the khan!" The dragon yanked the chain viciously, roaring. Tasigur sprawled on the stone floor. Shidiqi leaned down close to Tasigur. "The dragonlord informs you," she said, "that there is no khan. Speak that word again, maggot, and we will discover new and creative interpretations of the word 'agony.'" Tasigur hauled himself halfway to his feet, but Silumgar reeled him in, wrapping the golden chain around its thick, rubbery forearm. He slid and stumbled helplessly across the floor until he was crouched at the dragonlord's feet, Silumgar's acidic drool dripping dangerously close. The dragon rumbled in obvious pleasure. Shidiqi leaned down and put her face very close to Tasigur's, knowing he could only move toward Silumgar. "The dragonlord assures you," she said, "that this is a place of utmost pride." She smiled, a vicious, fanged smile. "After all, Tasigur," she said, "you are his finest trophy." Daghatar finished reading the letter. He read it again, just to be sure, then folded it crisply, cleanly in half. The oil lamp that burned on his field desk blurred, ever so slightly. Reyhan was dead, fallen at some last-ditch summit of the five khans. The Temur khan Yasova, of all people, had decided Daghatar needed to know that Reyhan had died saving the lives of two other khans. That should have been you, said a voice inside his head, with all the malice of an angry spirit. But the Remembrance was gone. It was only his voice, his own guilt, speaking to him. He set the folded letter on the table next to the lamp. A lean ainok soldier with dust-brown fur entered the tent, almost before he'd finished saying her name. "Send word to the dragonlord," he said. Both Abzan and khan were "forgotten words," not to be spoken, so he couched his message in the now-familiar euphemisms. "I've received intelligence that the leader of the holdouts is dead," he said. He sighed heavily. "Tell the dragonlord that if we move now, we can either force the remaining holdouts to surrender…or crush them for good." Beril held his gaze for a moment. She'd been under his command for a long time, and she had a sense for how he actually felt about the orders he gave. "Yes, sir," she said quietly. The tent flap closed, and he turned back to the table. He picked up the letter, touched one corner of it to the flickering flame of the oil lamp, and watched as it burned to ash. He silently said a forbidden prayer, a prayer he had spoken aloud many times in a booming voice for entire regiments to hear. It was a prayer for the dead, a simple expression of hope that the souls of the departed might find a place to rest in peace. He wondered if Reyhan's soul had anywhere peaceful left to go. Alesha rode as hard as she dared, her two bodyguards riding beside her. She was flying her own banner, readily visible across the steppe. Somewhere ahead of them, ever roaming, were the Mardu. The clan. Her clan. She'd left them to pursue this one last hope, but it had turned to ash, like everything the dragons touched. She cursed Tasigur, cursed his escape, cursed her fortune that she might never get to jam her blade all the way into his guts where it belonged. A storm was brewing, off in the distance. Red and purple lightning jagged through the sky, and the dark shapes of dragons were already roiling among the clouds. Storms came so frequently these days, and every one brought more dragons. She thought of Daghatar bending his knee to Dromoka, of Tasigur and whatever deal he'd managed to broker with Silumgar. She thought of Yasova, who had spoken, before they parted ways, of reaching some kind of arrangement with Atarka. 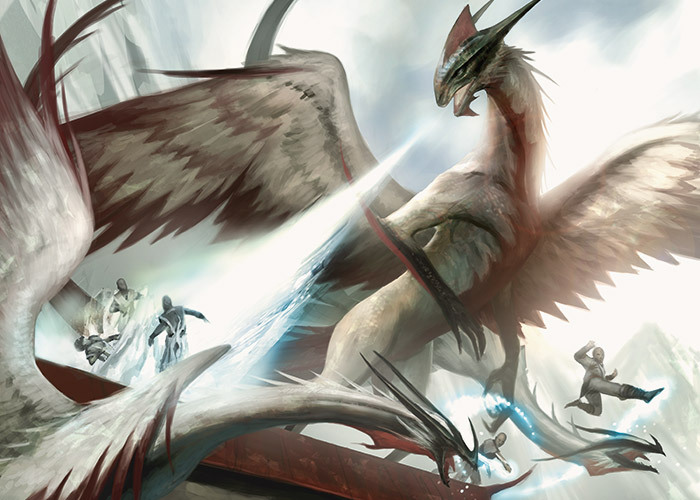 And with Ojutai perched in one of their four strongholds, the Jeskai were likely to capitulate as well. The khans fell. But the people lived. The clans weren't dying. They were changing. "Do you think the Mardu would ever kneel to a dragon?" she asked aloud. Jagun Wingmate, her orc bodyguard, turned in his saddle. "Mardu do not kneel," he yelled, over the thunder of hooves. "But they will follow you, wherever you go." "Look," said Doshiyn Eye-Piercer, her other bodyguard, pointing almost straight behind them. She was a quiet woman, only a little older than Alesha herself, with sharp eyes and a steady hand. Alesha craned her neck and saw. A dark shadow was racing across the steppe, skimming above it so low a warrior could probably hit it with a thrown spear—if that warrior didn't want to live much longer. Lightning rippled in its wake, scorching the earth. It was Kolaghan, the fastest thing that lived, the shadow of death itself. And she was going to pass right by them. "Break!" yelled Alesha. "Weapons ready!" All three horses wheeled around. Alesha and Doshiyn nocked arrows, and Jagun hefted a huge spear. Kolaghan didn't seem to see them. She was on her way to the storm, to welcome her new broodlings and assert her authority. Three humanoids on horseback were beneath her notice. "Hold," said Alesha. "Wait for my mark." Then Kolaghan's frills flared, and she roared and adjusted course to meet them. The great dragon loomed ever larger. She rolled as she approached, peering down at them. Her mouth hung open, ready to loose bolts of lightning that would fry them before the dragon ever touched them. Alesha raised her bow, ready to give the mark. Their eyes met. For a very brief instant, time seemed to stand still. The dragon's mouth closed. Alesha lowered her bow. And then Kolaghan was past, whipping past them in a cloud of charged dust. "You didn't fire," said Doshiyn. "I could have hit her." Alesha wheeled her horse, watched Kolaghan swiftly recede into the distance. "I understand now," she said. "The other dragons want to lead. They want to be called lord, to be served and bowed to." She reached behind her, pulled her banner out of its mounting on her saddle, and tossed it on the ground. "Kolaghan doesn't want to lead," she said. "She had the Mardu khan dead if she wanted it, and she knew it. And here I am." "What are you saying?" asked Doshiyn. "We don't have to kneel," said Alesha, grinning. "Just try to keep up." Jagun didn't return her smile. "I don't think I can do this," he said. "This is where I lead," said Alesha. "Follow, or don't." She kicked her horse and rode away. After a moment's hesitation, her bodyguards followed. Three warriors on horseback chased the impossible bolt of darkness that was Kolaghan, leaving the banner of the Mardu khan lying in the dust behind them. Yasova Dragonclaw walked along slowly beside a dead mammoth on a sledge. The smell of fresh blood was overpowering. She kept one hand on Anchin, her sabertooth. She'd fed him as much elk as he could eat before they brought down the mammoth, but every instinct he had must have told him to bury his head in its still-warm carcass and eat his fill. But the mammoth wasn't for him. She'd only taken one thing from it, the tip of one of its tusks that she'd painstakingly sawed off. She still had the piece of ivory tucked away. Her little entourage of warriors escorted the mammoth's body up into the mountains, toward a narrow valley called Ayagor. Atarka's roost. Dragons circled the caravan, and Yasova kept an eye out, ready to fight them off. But none landed, probably respecting Atarka's hunting grounds. The krushoks pulling the sledge wheezed and snarled, uneasy in the presence of raw meat and circling dragons. The men and women who trudged along with her were in no better mood. The valley of Ayagor opened around them. At the far end was an enormous pile of charred bones. Then a shadow passed over the sun, and Atarka's enormous bulk dropped to the ground in front of them like an avalanche. Her body radiated heat, her antlers glowed with internal warmth, and her mouth hung half open, ready to breathe fire on all of them. Anchin growled. Yasova pulled on the scruff of Anchin's neck until he followed her. She and her warriors ran back the way they'd came, Anchin padding along behind. They hid behind a fallen boulder to watch. Atarka regarded this strange scene for a moment, then roared and unleashed a torrent of flame that killed the krushoks, seared the mammoth meat, and set fire to the sledge. Then she devoured the mammoth, pulling its flesh free in huge chunks, before settling in to gnaw on the charred armored hide of the krushoks. When Atarka seemed settled, Yasova stepped out from behind the rock. She left her staff. Atarka's head rose sharply, blood dripping down her muzzle. She eyed Yasova hungrily, and her mouth dropped open. Yasova pointed to what was left of the mammoth's carcass, then spread her own empty hands. "Atarka!" she said. "I don't want to fight you anymore. I'm tired of fighting. That was a gift. Spare us, and there will be more." Atarka cocked her head, then roared and went back to chewing on the krushoks. "It seems we're dismissed," said Yasova. She gathered her warriors and left the valley. They walked in silence, back to the cave they'd been using as a hideout from the dragons. Someone built a fire. Yasova pulled out the piece of ivory from the mammoth's tusk and began to carve it with a small knife, continuing work she'd already started. 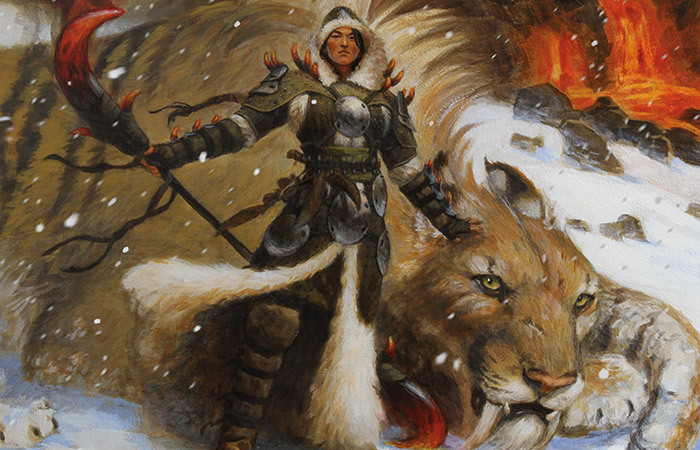 "I'm not sure how long it will take Atarka to understand that we'd rather hunt for her than fight her," said Yasova. "And even less sure whether she'll bother to tell the other dragons not to eat us." She shrugged. "It's a start, anyway." "Are you sure about this?" asked one of her warriors, a smooth-faced young man named Yeran. "No," said Yasova. "But I'm damned sure we weren't going to survive doing things the old way." She finished her work and held the piece of mammoth-ivory up to the firelight. It was a simple carving, using crude images and shamans' runes to show a group of people—Temur, the rune meant, specifically—offering meat to the dragon Atarka. She stood up and walked over to a low shelf of rock and set the carved piece of ivory next to the one that was already there. That one depicted a man with dragon wings, marked with the rune for khan written twice, standing beneath a dragon storm. "The future isn't yet written," she said. "It's up to us to write it, together. One day at a time."